Ketel Thorstenson, LLP (KTLLP) understands the struggle businesses have when it comes to managing their accounting software besides managing their taxes and finances. The KTLLP QuickBooks ProAdvisor team, certified by Intuit QuickBooks, wants to help by offering one-on-one QuickBooks training at a discounted rate. Now there is no need to attend a class or webinar and hope the instructor covers what you need to know. Train at KTLLP or onsite with a ProAdvisor and learn what pertains to your needs. The training special is structured into two offerings, 2 hours of training for $160 plus tax or 6 hours for $475 plus tax. Training session time can be broken down and used in smaller increments. The special runs through Sept. 28, 2018. Training time must be used by Dec. 17, 2018. To schedule training sessions or inquire for more details, contact the KTLLP ProAdvisors team at 605-342-5630. One focus for KTLLP, outside of tax season, is offering continuing education on all aspects of the accounting industry for clients and the community at large. Well known for their summer Lunch & Learn series (sessions held over the lunch hour covering a variety of topics including QuickBooks), the firm looks for ways to educate the community. Look for future Lunch & Learn dates posted on ktllp.com. 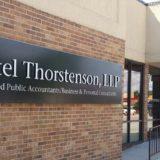 Ketel Thorstenson, LLP is a full-service firm with 16 partners, over 60 Certified Public Accountants, and offices in Rapid City, Custer, and Spearfish, SD. KTLLP has a rich history, serving clients since 1936 and a depth of knowledge and experience that clients rely on and trust. The firm offers a variety of services including tax planning and return preparation, audit services, QuickBooks support, Xero support, bookkeeping, payroll, business valuation, business consulting and estate planning.